Jakarta Satpol PP deploys 1,637 personnel particularly to help secure and ensure Asian Games 2018 success in Jakarta.
" 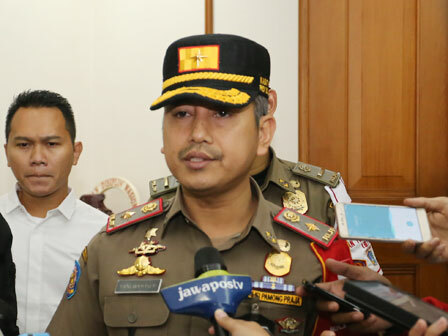 We want Asian Games event to run smoothly, safely, successfully, and amazingly from beginning to end"
Jakarta Satpol PP Head, Yani Wahyu Purwoko said, those personnel will be placed in three main spots: Wisma Atlet, Asian Games venues, and athlete's travel routes. "I will deploy 1,637 personnel to ensure Asian Games event success in Jakarta," he stated, Wednesday (7/4). He explained, Satpol PP personnel will be divided in two shift works, morning and night, to help police and TNI in maintaining safety and public order during Asian Games event. "Satpol PP personnel are also placed in tourism sites and crowded places such as mall," he informed. Currently, his side is actively keeping Asian Games icons safe, such as banner installed in office buildings, malls, and roadside. It is Satpol PP's effort in socializing Asian Games event.